Quality cleaners making Leeds homes gleam! We understand that selecting the right cleaner for your home can be tricky, as you want someone who's honest, thorough and can be relied upon to do a great job. When it comes to finding cleaners in Leeds, we believe that we offer the fairest prices and have the best staff - because everyone is vetted and qualified. Call us and you'll discover why we have a long history of delivering outstanding cleaning to homes and businesses all over Leeds, and have a plethora of happy customers. We're keen to fulfil your domestic needs, so will talk through your requirements and provide a cleaning service at a cost and frequency that will suit you. All our staff come to you with a clear understanding of what you expect, and references are available. 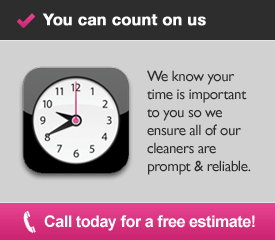 We can provide you with a wide range of services in your home or office and always ensure the highest quality results. One of the reasons why we have many regular clients. We cover all LS postcodes and we offer great value for money. Full public liability insurance gives customers peace of mind and to add to that, every member of our team is fully CRB checked. Why not get in touch and talk to us today by calling us on 0113 370 9250. It was refreshing to find a reliable, Leeds based cleaning company who genuinely seemed to care about the quality of their work. We always felt we were getting excellent value for money.